A romantic drama, Words And Pictures explores two damaged souls finding salvation in each other, but all the literary pretensions cannot conceal the film's predictable foundations. Jack Marcus (Clive Owen) is a washed-up English teacher at the upscale Croydon College in Maine. Once a marginally famous published author, he is now increasingly dependent on the bottle to get through the day. The College administration start proceedings to review his performance with a strong inclination to terminate him. His students include the studious Emily (Valerie Tian) and Cole (Josh Ssettuba), and the mischievous Swint (Adam DiMarco). Dina Delsanto (Juliette Binoche) arrives at Croyden as the new Fine Arts teacher. Once a famous artist, she is now hobbled by rheumatoid arthritis and increasingly bitter about her declining abilities. Jack and Delsanto clash about the value of written literature relative to the visual arts, and their academic rivalry re-ignites his passion for teaching. Emily is particularly inspired by Dina, but has to deal with a bullying episode. Although Dina and Marcus develop a mutual attraction, his drinking leaves him susceptible to self-destructive behaviour. Directed by Fred Schepisi and written by Gerald Di Pego, Words And Pictures attempts a relatively cerebral take on romamce, and targets a more mature audience. This is a love story in an academic milieu featuring grown-ups hauling plenty of real-world luggage and finding a new spark on life thanks to a professional rivalry. The dialogue is rich with prose espousing the virtues of the written word (from Marcus) and the beauty of the image (from Delsanto), and while initially fresh, the sparring exhausts itself relatively early. Di Pego also falls into a trap of his own making, Marcus' silly game of trading multisyllabic words in alphabetical order overstaying its welcome by about one hour and five syllables. The two central characters are in midst of suffering when they meet, and a grizzled weariness permeates the film as an antidote to romance flimsiness. Marcus is drinking heavily and in full descent into don't care mode, with dismissal the next logical step. Delsanto (as he insists on calling her) is relocating from the glamour of New York City to the relative backwater of a Maine prep college, her arthritis increasing dictating her art. Competing for the hearts of the same students, he tries to shape up, dry out and re-energize the student literary magazine, and she attempts to reinvent her painting style and ignite Emily's passion. Both will stumble and take backward steps along the journey, and their clash and tentative efforts towards self-improvement maintain a modicum of narrative interest. 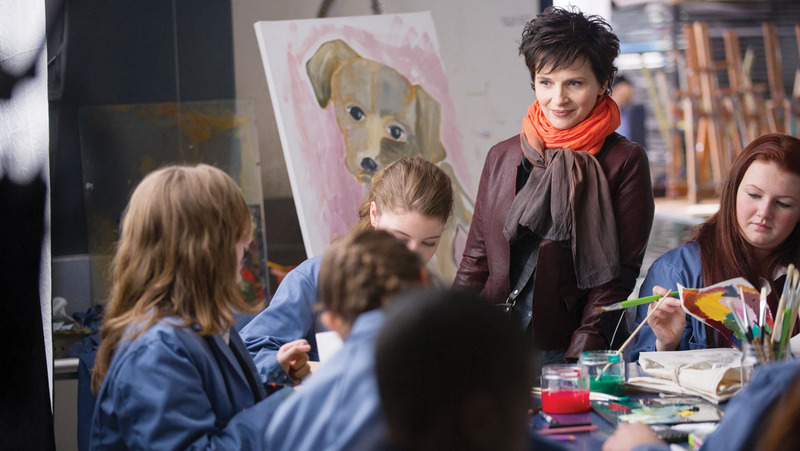 Clive Owen and Juliette Binoche are never less than serviceable, but the roles hardly demand a stretch. All the secondary and supporting cast are short-changed and generally abandoned. Emily is first subjected to a too-quickly forgotten bullying incident and then a truncated art mentorship, and she is the only student provided with any kind of meaningful screen time. Words And Pictures has both elegant words and pretty pictures, plus also plenty of bland faux artistry.